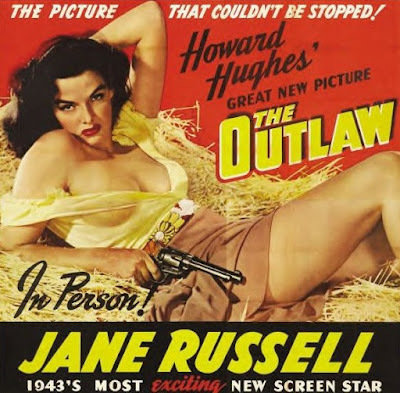 The late Jane Russell, who passed away last month aged 89, got her big break in this weird RKO Western produced and directed by mad aviation tycoon Howard Hughes, with a little help from an uncredited Howard Hawks. The famously buxom Russell was featured prominently on the film's poster artwork (above) and in its publicity campaign but, in truth, her role as a feisty Mexican love interest is fairly minor and doesn't stand up well in comparison with Linda Darnell's similar Chihuahua in the John Ford classic My Darling Clementine (1946). However, Russell's bountiful rack is showcased at every possible opportunity by Hughes and was the cause of a two-year delay in The Outlaw's release, as censors objected to the sheer amount of screen time devoted to the Russell assets, leading to much wrangling and re-cutting. The controversy was in turn put to good use by the studio PR department, however, and, eventually, a star was born. 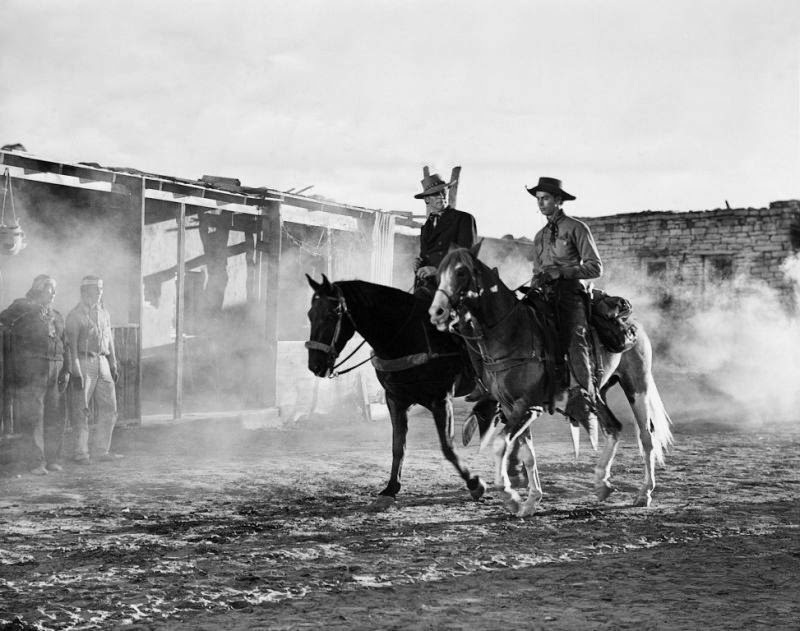 The film itself is really a bizarro, oddly gay, male relationship melodrama about the burgeoning friendship between ageing bandit Doc Holliday (Walter Huston) and hip young gunslinger Billy the Kid (Jack Buetel, a dead ringer for narcissistic Portuguese footballer Cristiano Ronaldo), the cause of no little frustration to Doc's oldest pal, the jealous lawman of Lincoln, New Mexico, Pat Garrett (professional Irishman and fan favourite Thomas Mitchell). 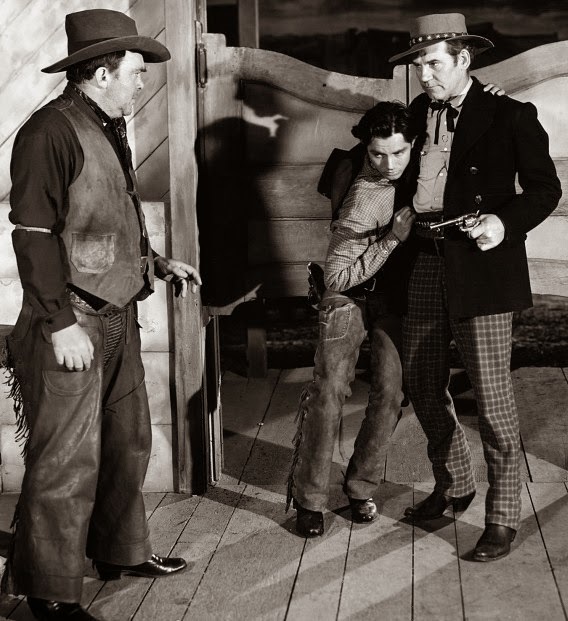 The story itself is pretty slight - Doc and Billy bond over a stolen horse, bicker with a local deputy, hide out when the Kid takes a bullet from Garrett and then feud over Russell with the sheriff on their tail. Er, that's it. Gregg Toland's cinematography is attractive and the direction by Hughes is accomplished enough, even if there is the occasional strange moment - as when we are presented with an empty shot of a door frame while Victor Young's score swells bombastically or shown a slow-motion close-up of Russell's chin for no apparent reason - but quite what screenwriters Jules Furthman and Ben Hecht (again, uncredited) were getting at is anyone's guess. The less-than-subtle Freudian subtexts are too half-arsed to have much bearing. Nevertheless, Walter Huston, father of legendary director John, is fun as an older, wiser Doc Holliday than Victor Mature played in Clementine, Mitchell gets to be a little more menacing than usual and Buetel is surprisingly good in the lead, portraying the legendary outlaw as a preternaturally self-possessed young man all too used to relying on his own wits and trigger finger. The Outlaw is ultimately an interesting failure (even the date on Doc's grave is wrong) but worth a punt anyway to see what all the fuss was about back in 1943. I'd rate it narrowly ahead of the disappointing Sam Peckinpah take on the same characters, Pat Garrett & Billy The Kid (1973), starring James Coburn, Kris Kristofferson and Bob Dylan, but perhaps that's not saying much.